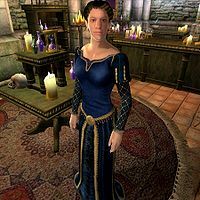 Claudette Perrick is a Breton alchemist and proprietor of The Gilded Carafe in the Imperial City Market District. She sells alchemy apparatus, ingredients, and potions. Until you complete the Unfriendly Competition quest, Claudette complains that Thoronir's low prices at The Copious Coinpurse are hurting her business. Like most of her merchant colleagues, she dedicates her life to her shop and only allows herself a limited amount of spare time. Her bedroom is located on the second floor of the shop, and she sleeps there every night between midnight and 6am. After waking up, she heads downstairs and takes her breakfast at the small dining arrangement at the bottom of the stairs. At 8am, she unlocks the door to open the shop up for business. She closes up at 8pm and immediately exits the shop for an evening stroll at the city's popular Arboretum. At midnight, she heads back to her shop and her bed. After closing up shop on Sundas, Claudette will treat herself to dinner and drinks at the Merchants Inn until midnight. She wears traditional upper-class attire consisting of a blue velvet outfit with matching blue suede shoes. She also carries a sample of glow dust, her shop key, and a considerable amount of gold. In combat, Claudette relies on a standard set of leveled spells typical for alchemists. When you approach her in the shop, she will always greet you with: "I have everything for the budding alchemist under one roof." When asked about the city, she will do a bit of advertising for a friend of hers: "Also try my friend, Ogier Georick, The Main Ingredient, here in the District." Being an alchemist by heart, she will be more than puzzled if you present her with a sample of nirnroot: "That root seems to have strange properties the likes of which I've yet to see duplicated in other flora of its ilk. Hmmmm... I believe that Sinderion in Skingrad could serve your inquiry better, as his area of expertise centers around things of this nature." On the unfair competition made by Thoronir, she has the following to say: "That guy is going to run me out of business soon. His prices are so low, I don't know how he does it. I think he's up to something. If you're interested, you should head over to Jensine's 'Good as New' Merchandise. She heads up a committee that is trying to investigate him." When all is said and done, she will be more forgiving: "Thoronir didn't turn out to be such bad fellow after all. I'm glad he decided to join the Society." And, after you have solved the problem, she will add a little extra to her usual greeting: "Hello again. You're more than welcome here!" "Claudette Perrick runs a fine alchemy shop. You should check out The Gilded Carafe." "Have you shopped at the Gilded Carafe?" and "Isn't the Gilded Carafe a nice shop?" "It's a nice store, at least for alchemists." "Claudette does a good job. Still, she should rename the place." "I've browsed Claudette's shop, but I haven't spent much time there." "I've never shopped there, but I know she carries good alchemy equipment." Even competitor Ogier Georick will point you towards her: "If I don't have what you need, try Claudette Perrick at 'The Gilded Carafe'. That's right here in the Market District." She clearly enjoys the respect of her fellow merchants, as Jensine will say when discussing Thoronir: "So, Claudette sent you, huh? Well then, she usually sizes up people well, so you may be just what we're looking for." If your Mercantile skill is at least 50, the Birthright of Astalon will become available in Claudette's inventory. It is a unique cuirass available nowhere else. If you approach the nirnroot sample in her shop, it will show the red hand icon to indicate that taking it is stealing, however you will not receive a bounty for taking it. This page was last modified on 16 August 2018, at 12:18.